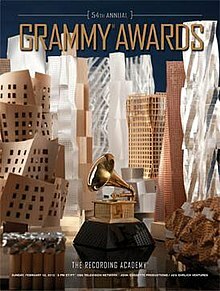 The 54th Annual Grammy Awards were held on February 12, 2012, at the Staples Center in Los Angeles being broadcast on CBS. LL Cool J hosted the show. It was the first time in seven years that the event had an official host. Nominations were announced on November 30, 2011 on prime-time television as part of "The GRAMMY Nominations Concert Live! – Countdown to Music's Biggest Night", a one-hour special broadcast live on CBS from Nokia Theatre at L.A. Live. Kanye West received the most nominations with seven. Adele, Foo Fighters, and Bruno Mars each received six nominations. Lil Wayne, Skrillex, and Radiohead all earned five nominations. The nominations were criticised by many music journalists as Kanye West's My Beautiful Dark Twisted Fantasy missed out on a nomination for Album of the Year despite being highly critically acclaimed and topping many end of year charts. West's album went on to win Best Rap Album. A total of 78 awards were presented following the Academy's decision to restructure the Grammy Award categories. Paul McCartney received the MusiCares Person of the Year award on February 10, 2012, at the Los Angeles Convention Center, two nights prior to the Grammy telecast. On February 8, 2012, the Academy announced that the 54th Grammy Pre-Telecast Ceremony would stream live internationally. The ceremony took place at the Los Angeles Convention Center and was streamed live in its entirety internationally at Grammy's official website and CBS Television Network. The ceremony was co-hosted by Dave Koz and MC Lyte. A total of 68 awards were presented in the Pre-Telecast ceremony. The official poster was designed by Architect Frank Gehry. The day before the ceremony, Whitney Houston died in Los Angeles, and the show's producers quickly planned a tribute in the form of Jennifer Hudson singing Houston's "I Will Always Love You". The awards show began with a Bruce Springsteen performance followed by an LL Cool J prayer for Whitney Houston. Adele (for whom would later discover she was pregnant) won all of her six nominations, equalling the record for most wins by a female artist in one night, firstly held by Beyoncé Knowles. Adele became only the second artist in history, following Christopher Cross in 1981, to have won all four of the general field (Album of the Year, Best New Artist, Record of the Year and Song of the Year) awards throughout her career. Foo Fighters and Kanye West followed with five and four awards, respectively. The 54th Grammys were the second-highest rated in its history with 39.9 million viewers, second only to the 1984 Grammys with 51.67 mil. viewers. The rating was 50% higher than in 2011. The E Street Band "We Take Care of Our Own"
Chris Brown "Turn Up the Music"
Kelly Clarkson "Don't You Wanna Stay"
The Civil Wars "Barton Hollow"
Carrie Underwood "It Had to Be You"
deadmau5 "I Can Only Imagine"
Abe Laboriel Jr. "Golden Slumbers"
Maceo Parker was scheduled to pay tribute to Clarence Clemons following the montage of those that had died in 2011 although his tribute was dropped in the 24 hours leading up to the awards show to make room for the Jennifer Hudson tribute to Whitney Houston. In Concert on Broadway – Harry Connick, Jr.
Wao Akua: The Forest of the Gods – George Kahumoku, Jr.
All About Bullies ... Big and Small – Various Artists Producers Steve Pullara, Jim Cravero, Pat Robinson, Kevin Mackie and Gloria Domina. "Hunting Wabbits 3 (Get Off My Lawn)"
"Bowen: Symphonies Nos. 1 & 2"
"Haydn: Symphonies 104, 88 & 101"
"Beyond All Mortal Dreams – American A Cappella"
"Brahms: Ein Deutsches Requiem, Op. 45"
"The Natural World of Pelle Gudmundsen-Holmgreen"
"Schwantner: Concerto for Percussion & Orchestra"
"Chinese Recorder Concertos – East Meets West"
"Rachmaninov: Piano Concerto No. 2 in C Minor, Op. 18; Rhapsody on a Theme of Paganini"
"Rachmaninov: Piano Concertos Nos. 3 & 4"
"Winging It – Piano Music of John Corigliano"
Amy Winehouse, Nick Ashford, Phoebe Snow, Jerry Leiber, Steve Jobs, Heavy D, Sylvia Robinson, Nate Dogg, M-Bone, Jimmy Castor, George Shearing, Roger Williams, Ray Bryant, Gil Cates, Fred Steiner, Dobie Gray, Ferlin Husky, Larry Butler, Wilma Lee Cooper, Harley Allen, Liz Anderson, Charlie Craig, Barbara Orbison, Frank DiLeo, Steve Popovich, Tal Herzberg, Bruce Jackson, Johnny Otis, Benny Spellman, Don DeVito, Roger Nichols, Stan Ross, Joe Arroyo, Facundo Cabral, Marv Tarplin, Esther Gordy Edwards, Carl Gardner, Cornell Dupree, Jerry Ragovoy, Gene McDaniels, Joe Morello, Gil Bernal, Frank Foster, Ralph MacDonald, Leonard Dillon, Clare Fischer, Bert Jansch, Andrew Gold, Bill Morrissey, Warren Hellman, Hazel Dickens, Gary Moore, Gerard Smith, Doyle Bramhall, Pinetop Perkins, Hubert Sumlin, David "Honeyboy" Edwards, Camilla Williams, Milton Babbitt, David Mason, Andy Kazdin, Alex Steinweiss, Bill Johnson, Jessy Dixon, Don Butler, Clarence Clemons and Whitney Houston. ^ "LL Cool J To Host 54th Annual GRAMMY Awards". Grammy.com. January 18, 2012. Retrieved August 1, 2017. ^ "Jason Aldean, Lady Gaga To Perform At "The GRAMMY Nominations Concert Live!!"". GRAMMY.com. October 25, 2011. Retrieved November 18, 2011. ^ a b c "Grammy.com". National Academy of Recording Arts and Sciences. February 12, 2012. Retrieved February 12, 2012. ^ "Paul McCartney Is 2012 MusiCares Person Of The Year". GRAMMY.com. Retrieved November 18, 2011. ^ a b "Watch live: 2012 GRAMMY Pre-Telecast Ceremony". Grammy.com. February 8, 2012. Retrieved August 1, 2017. ^ "Grammys 2012: Whitney Houston tribute to be sung by Jennifer Hudson". Latimesblogs.latimes.com. February 11, 2012. Retrieved August 1, 2017. ^ "Adele wins 6 Grammys, including record of the year". The Clarion-Ledger. Gannett Company. February 12, 2012. Retrieved February 12, 2012. ^ Morris, Christopher (12 February 2012). "Adele's '21' wins album of the year at Grammys". Variety. Archived from the original on 16 December 2013. Retrieved 25 March 2013. ^ Braiker, Brian; Alston, Joshua (February 13, 2012). "Grammys 2012 – as it happened". Guardian. London. Retrieved March 6, 2012. ^ "Whitney Houston Tragic Grammys Draw 39.9 Million Viewers, Second Most Watched Ever". Deadline.com. February 13, 2012. Retrieved February 14, 2012. ^ "The Beach Boys To Reunite At 54th GRAMMY Awards". Grammy.com. February 8, 2012. Retrieved August 1, 2017. ^ Chianca, Pete (February 13, 2012). "Grammy disappointment: Tribute to Clarence Clemons was scrapped, says report | Blogness on the Edge of Town Massachusetts". Blogs.wickedlocal.com. Retrieved January 14, 2014. ^ "Complete List of Nominees for the 54th Annual Grammy Awards | E! Online UK". Ca.eonline.com. November 30, 2011. Retrieved January 14, 2014. ^ "The Recording Academy, Clive Davis Partner For Pre-GRAMMY Ga". Grammy.com. January 19, 2012. Retrieved August 1, 2017. ^ "The Recording Academy Announces Special Merit Award Honorees". Grammy.com. December 21, 2011. Retrieved August 1, 2017.